This set has it all. Hello Kitty in pink goggles. A pink scooter with trailer that lights up. And a set of stamps and paper and other crafty goodies in the shape of little cakes and their packaging. Just $9.99 at ToysRUs. 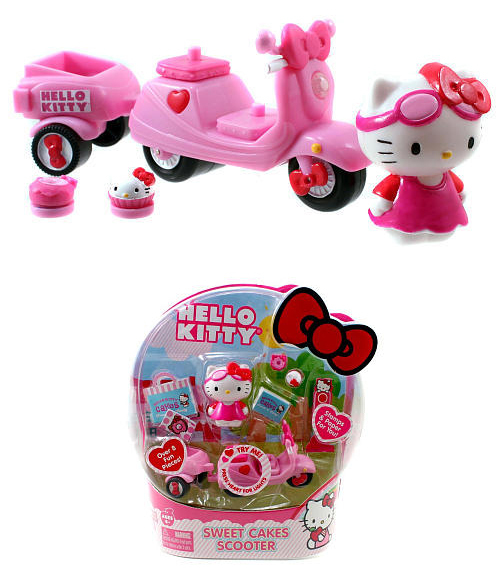 This entry was posted in Models, Figurines, Toys and tagged cart, dessert, hello kitty, lights, model, scooter, sweet cakes, toy by Tracy. Bookmark the permalink.